University of Auckland engineering professors, John Boys and Grant Covic, are world-leaders in the commercial application of inductive power transfer (IPT). This technology is a method of transferring electrical power from a source to an electrical load, without synthetic conductors. Applications of IPT range from electric toothbrush chargers to high-technology “clean-room” manufacturing plants. IPT technology stems from early electrical research. In 1820 French physicist and mathematician Andre Marie Ampère (1775–1836) was one of the discoverers of electromagnetism, finding that electric current moving in a wire creates a magnetic field. In 1831 Michael Faraday (1791–1867) discovered electromagnetic induction by varying magnetic flux to create electromagnetic force in a conductor. Then in the late nineteenth century Nicholas Tesla (1856–1943) demonstrated wireless energy transmission using a high-tension induction coil. These early discoveries and experiments showed IPT was possible but its wider use was limited because the component materials and controls had not been developed yet. From 1988 Professors John Boys and Grant Covic at the University of Auckland’s School of Engineering were the first in the world to evolve materials and controls for the commercial application of IPT. They patented the technology required to enable full IPT from one object by intersecting two magnetic fields. This was an important step because it was under full control and remained within acceptable emission limits for people. Boys and Covic continued to develop this idea so that transferring power over larger gaps was possible. Collaborating with Japanese firm Daifukun and then Qualcomm, they applied IPT technology and materials for the wireless charging of home appliances (air gaps 1–2 millimetres) and fully automated industrial vehicles (air gaps 10–30 millimetres). Future applications could include charging electric cars in both static and dynamic situations. 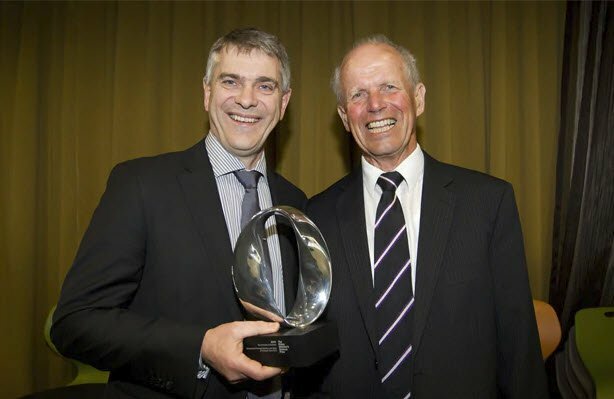 In 2012 Boys and Covic presented the Institution of Professional Engineers New Zealand’s (IPENZ) Pickering Lecture on this topic, and were awarded the New Zealand Prime Minister’s Science Prize 2013 and KiwiNet Research Entrepreneur Award 2013. Grant Covic, left, and John Boys. Image courtesy Fairfax. ”Science award winners silence sceptics”, Dominion Post, 13 November 2013. Owen Poland, “Magnetic Intersection”, Engineering Insight, Vol.14:6 (November/December 2013), pp.35-37.